The tibia /ˈtɪbiə/ (plural tibiae /ˈtɪbii/ or tibias), also known as the shinbone or shankbone, is the larger and stronger of the two bones in the leg below the knee in vertebrates (the other being the fibula), and it connects the knee with the ankle bones. The tibia is found on the medial side of the leg next to the fibula, and closer to the median plane or centre-line. The tibia is connected to the fibula by the interosseous membrane of the leg, forming a type of fibrous joint called a syndesmosis with very little movement. 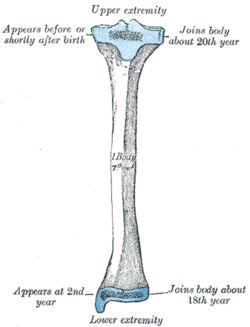 The tibia is named for the flute tibia. It is the second largest bone in the human body next to the femur. The leg bones are the strongest long bones as they support the rest of the body. In human anatomy the tibia is the second largest bone next to the femur. As in other vertebrates the tibia is one of two bones in the lower leg, the other being the fibula, and is a component of the knee and ankle joints. The leg bones (femur, tibia and fibula) are the strongest long bones as they have to support the rest of the body. The tibia is categorized as a long bone and is as such composed of a diaphysis and two epiphyses. The diaphysis is the midsection of the tibia also known as shaft or body. While the epiphyses are the two rounded extremities of the bone; an upper (also known as superior or proximal) closest to the thigh and a lower (also known as inferior or distal) closest to the foot. The tibia is most contracted in the lower third and the distal extremity is smaller than the proximal. The proximal or upper extremity of the tibia is expanded in the transverse plane with a medial and lateral condyle, which are both flattened in the horizontal plane. 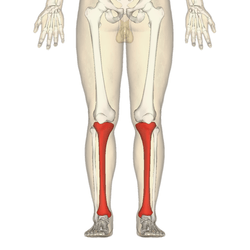 The medial condyle is the largest of the two and is better supported over the shaft. The upper surfaces of the condyles articulates with the femur to form the tibiofemoral joint, the weightbearing part of the kneejoint. The medial and lateral condyle are separated by the intercondylar area, where the cruciate ligaments and the menisci attach. Here the medial and lateral intercondylar tubercle forms the intercondylar eminence. Together with the medial and lateral condyle the intercondylar region forms the tibial plateau, which both articulates with and is anchored to the lower extremity of the femur. The intercondylar eminence divides the intercondylar area into an anterior and posterior part. The anterolateral region of the anterior intercondylar area are perforated by numerous small openings for nutrient arteries. The articular surfaces of both condyles are concave, particularly centrally. The flatter outer margins are in contact with the menisci. The medial condyles superior surface is oval in form and extends laterally onto the side of medial intercondylar tubercle. The lateral condyles superior surface is more circular in form and its medial edge extends onto the side of the lateral intercondylar tubercle. 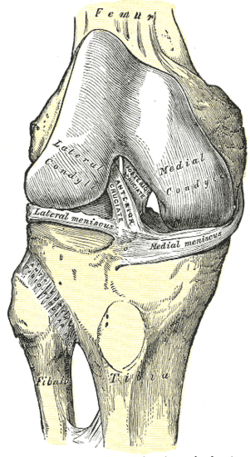 The posterior surface of the medial condyle bears a horizontal groove for part of the attachment of the semimembranosus muscle, whereas the lateral condyle has a circular facet for articulation with the head of fibula. 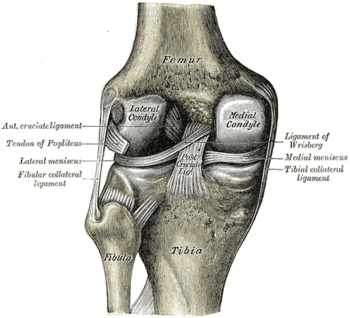 Beneath the condyles is the tibial tuberosity which serves for attachment of the patellar ligament, a continuation of the quadriceps femoris muscle. 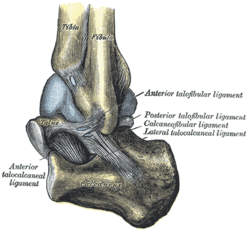 The lower extremity of the tibia is much smaller than the upper extremity and presents five surfaces; it is prolonged downward on its medial side as a strong pyramidal process, the medial malleolus. 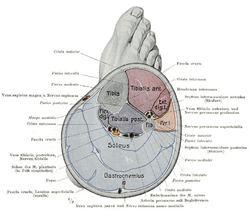 The lower extremity of the tibia together with the fibula and talus forms the ankle joint. 1 2 3 4 Drake, Richard L.; Vogl, A. Wayne; Mitchell, Adam W. M. (2010). Gray´s Anatomy for Students (2nd ed.). pp. 558–560. ISBN 978-0-443-06952-9. 1 2 3 4 Drake, Richard L.; Vogl, A. Wayne; Mitchell, Adam W. M. (2010). Gray´s Anatomy for Students (2nd ed.). pp. 584–588. ISBN 978-0-443-06952-9. ↑ Nelson G, Kelly P, Peterson L, Janes J (1960). "Blood supply of the human tibia". J Bone Joint Surg Am. 42–A: 625–36. PMID 13854090. ↑ Rytter S, Egund N, Jensen LK, Bonde JP (2009). "Occupational kneeling and radiographic tibiofemoral and patellofemoral osteoarthritis". J Occup Med Toxicol. 4 (1): 19. doi:10.1186/1745-6673-4-19. PMC 2726153 . PMID 19594940. ↑ Gill TJ, Van de Velde SK, Wing DW, Oh LS, Hosseini A, Li G (December 2009). "Tibiofemoral and patellofemoral kinematics after reconstruction of an isolated posterior cruciate ligament injury: in vivo analysis during lunge". Am J Sports Med. 37 (12): 2377–85. doi:10.1177/0363546509341829. PMC 3832057 . PMID 19726621. ↑ Wehner, T; Claes, L; Simon, U (2009). "Internal loads in the human tibia during gait". Clin Biomech. 24 (3): 299–302. doi:10.1016/j.clinbiomech.2008.12.007. PMID 19185959.